Upton-upon-Severn really comes to life when it plays host to several music and jazz festivals throughout the year. On May day bank holiday there is a Folk Festival, the Jazz Festival is in late June, the Blues Festival is in July and the Sunshine Music Festival is on August bank holiday. For families with children, there is a good range of primary and secondary schooling in the area including the Hanley Swan St Gabriel's with St Mary's CofE Primary School, Upton-upon-Severn CofE Primary School and Hanley Castle High School. The town is conveniently located for traveling to Malvern (7 miles), Worcester (10 miles) and Cheltenham (17 miles) with junction 1 of the M50 just 5 miles away which connects to the M5 at junction 8. You can take direct trains to London and Birmingham from Malvern, Worcester and Cheltenham. 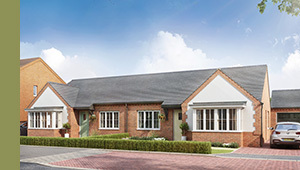 The Elcot - Choose from a 2 bedroom or 3 bedroom layout. By filling out your details and clicking on 'Send' you will be added to our email list for this development. We will send you information about the launch date, prices (when they are available) and any other relevant information such as special offers and showhome openings. You may unsubscribe at any time. Please check your email and click the link in the email we sent you to confirm subscription to the list. Thank you for your interest - we will send you more information shortly. Specification details are indicative only. Kendrick Homes reserves the right to alter the specification at any time. Interior images shown are typical Kendrick Homes interiors only. * Plot specific, please speak to the Sales Negotiator.